Trippy projections illuminating San Francisco’s Conservatory of Flowers commemorate the summer of 1967. Combine a surplus of 1960s tribute music, hundreds of block parties, and flower crown ubiquity rivaling Coachella, and you have an idea of what the 50th anniversary of the Summer of Love in San Francisco will be like. The months-long multi-event festivities commemorate the summer of 1967, when about 100,000 hippies congregated in Haight-Ashbury to spread good vibes and spur the counterculture. 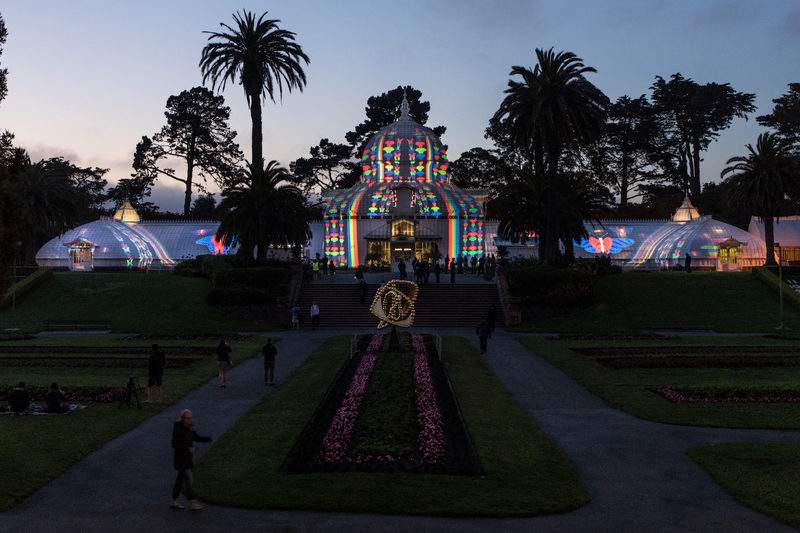 Described as a place of beauty meant to “connect people and plants,” the Conservatory of Flowers in Golden Gate Park is an 138-year-old architectural masterpiece frequented by botany students, San Francisco residents, and garden-loving tourists. 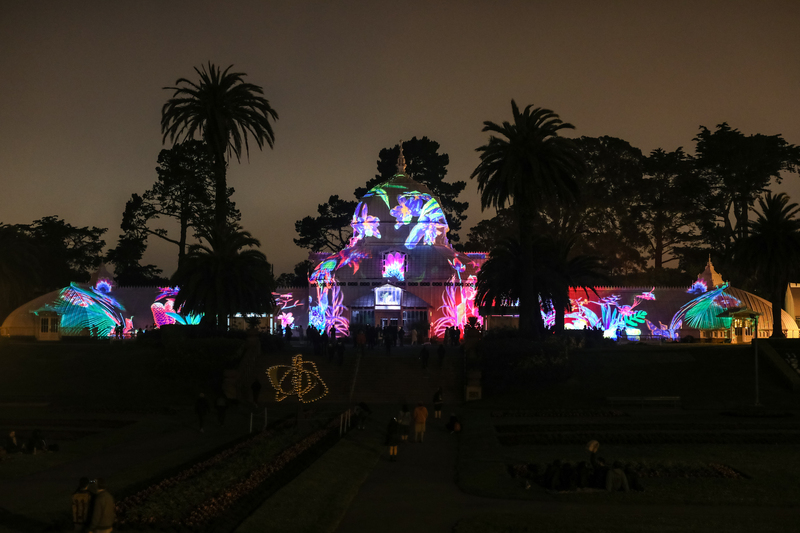 For Summer of Love 2017, a spectacular light installation steeps the historic building, and everyone around it, in psychedelic projections. At opening night on June 21, attendees were encouraged to wear tie-dye to evoke the flower-child spirit. 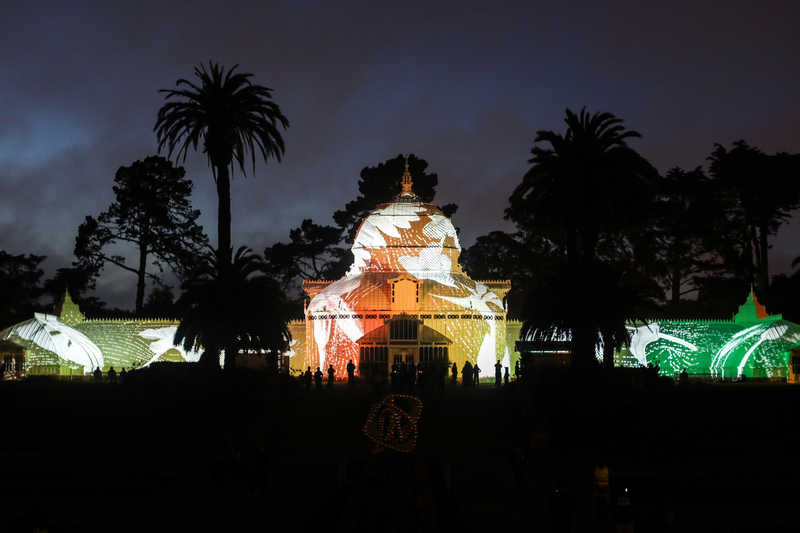 A nightly illumination takes place at dusk every evening through late October. 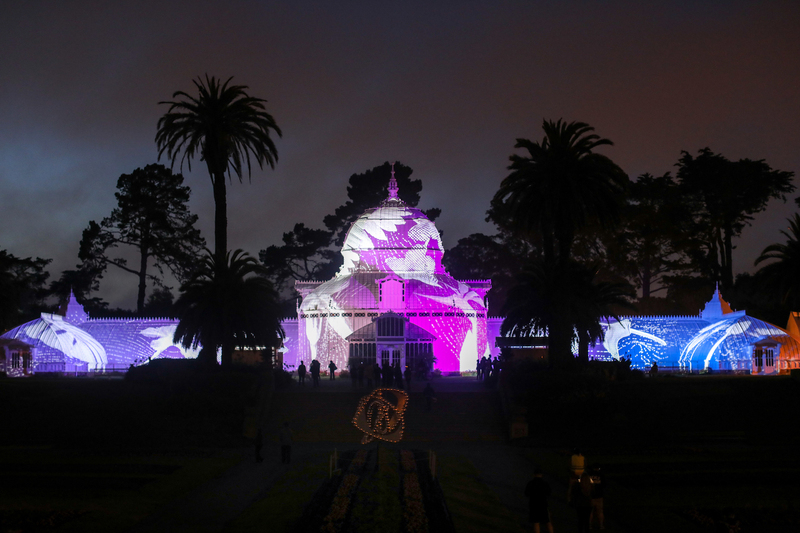 The creative force behind the nightly projections unites two teams known for their mastery when it comes to large-scale light. 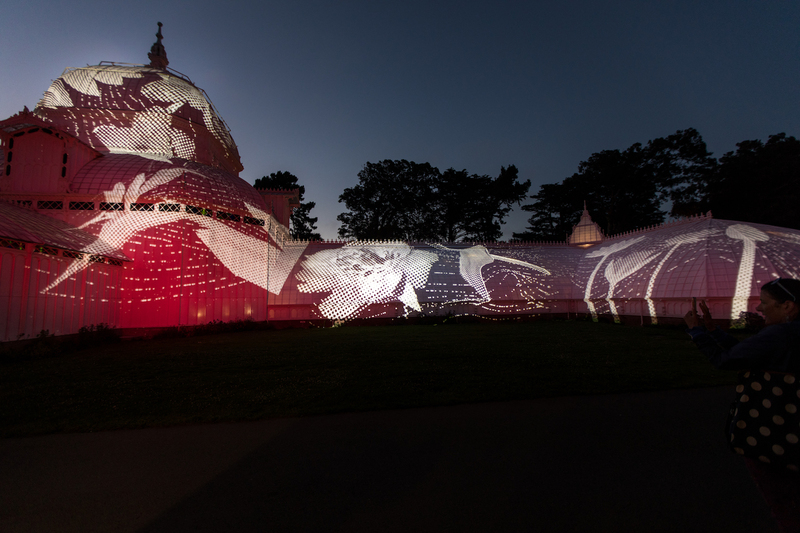 Obscura Digital has lit the Empire State Building with endangered animals, put faces on the Sydney Opera House, and mesmerized thousands of Coachella festivalgoers with the largest-ever projection inside a geodesic dome. 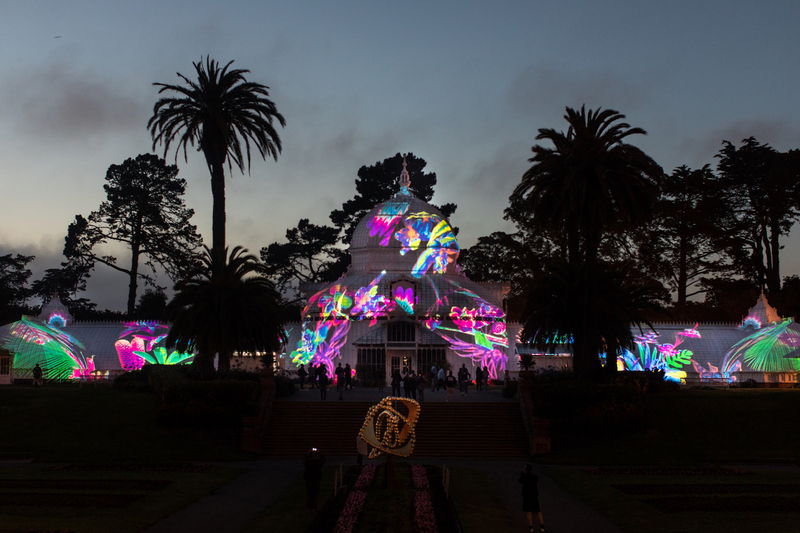 Ben Davis from Illuminate, the production company behind Leo Villareal’s dazzling Bay Lights, initiated the massive project in collaboration with Obscura, using 10 weather-resistant gobo projectors to light up the all-white building with flowers, butterflies, and other psychedelic glowing motifs Obscura is famous for. 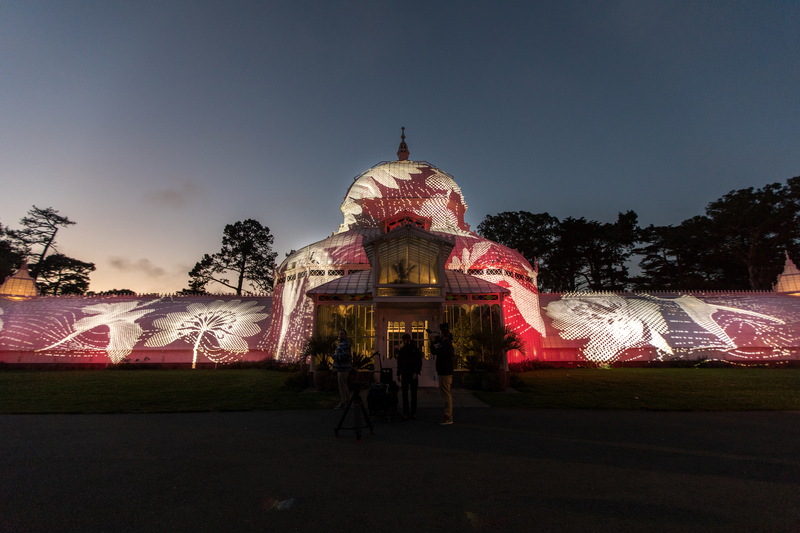 The illuminated intervention is temporary for now, but it may turn into a permanent feature at the Conservatory. Keep up with the project here.